Save Additional $167.70 When Paying With Bank Wire. You pay $5,422.30. Automatic self-winding movement. 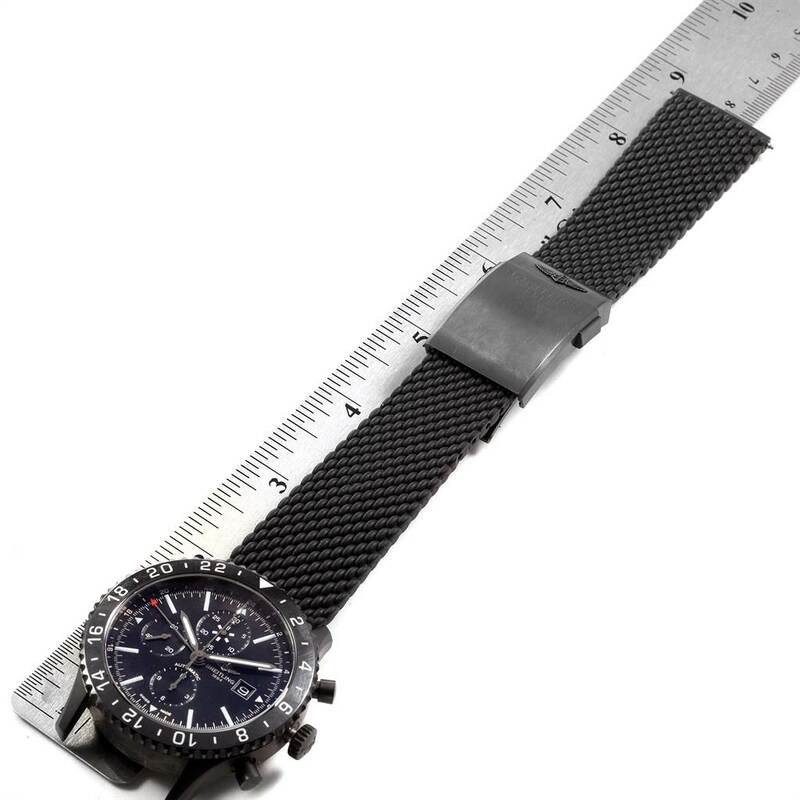 GMT and chronograph function. 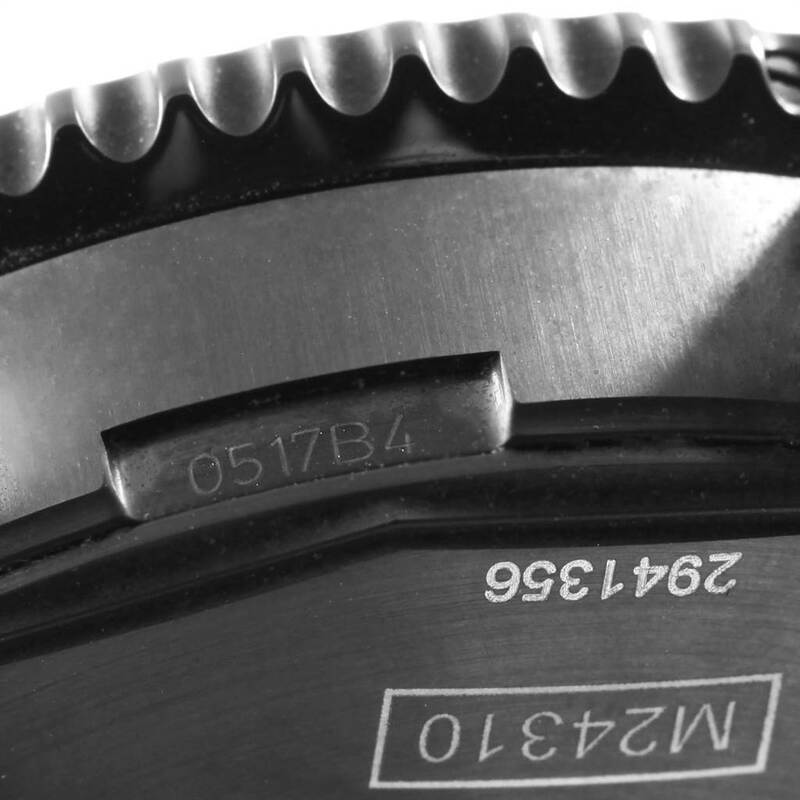 Blacksteel case 46.0 mm in diameter. Polished black bidirectional rotating ceramic bezel with white filled Arabic Numeral and baton hour markers. 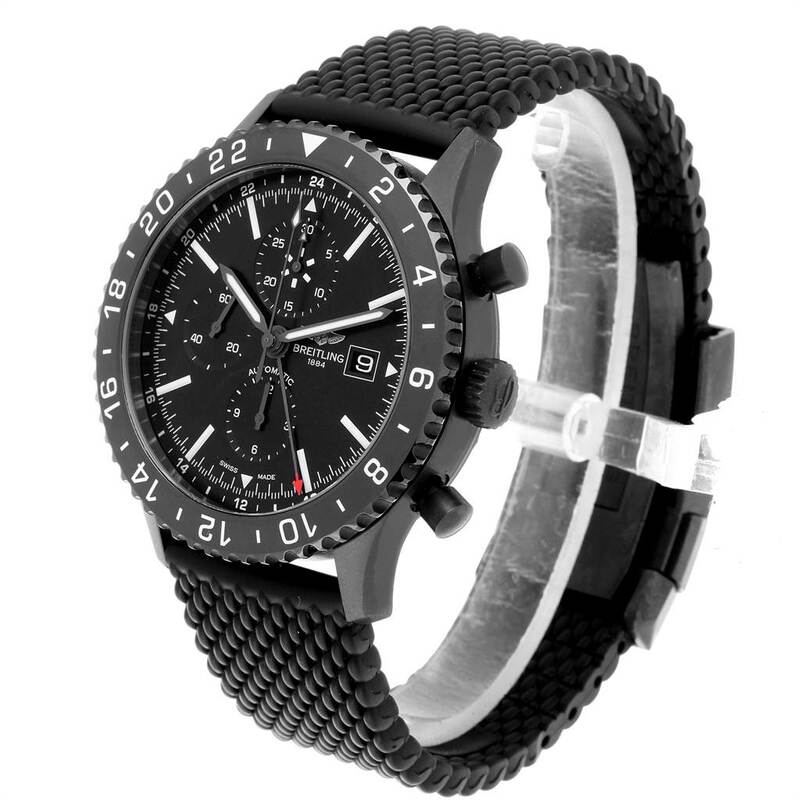 Black dial with baton luminous hands and index hour markers. Large central seconds counter hand. Date aperture at 3 o’clock. 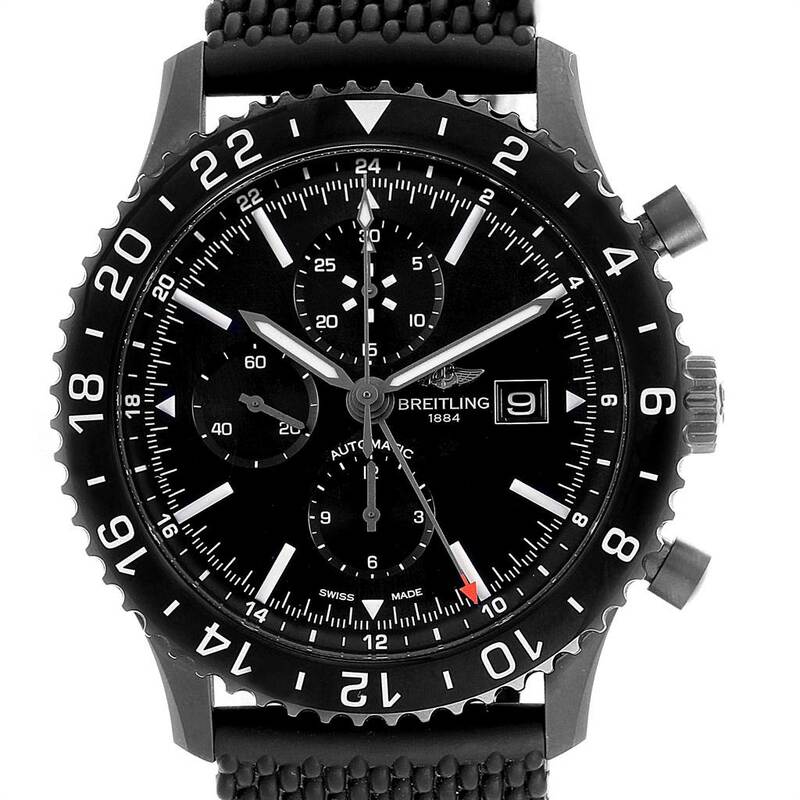 The chronograph subdials - 30 minute counter sub-dial located at the 12 o'clock position. 12 hour counter sub-dial at the 6 o'clock position. Small seconds hand sub-dial located at the 9 o'clock position. Black rubber strap with push button deployent buckle. Fits 8.5" wrist. 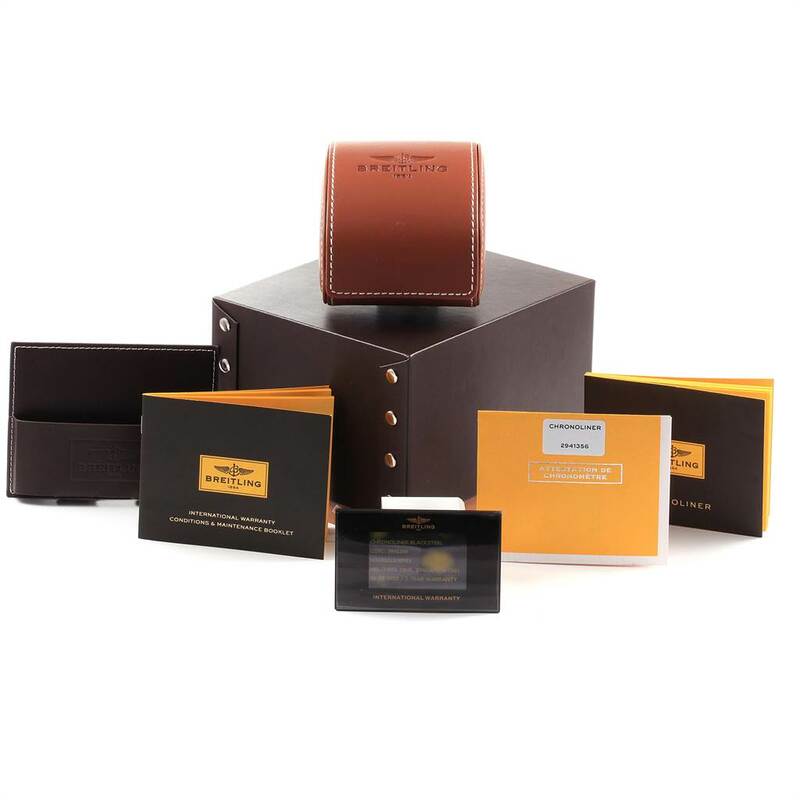 The watch is covered by Swiss Watch Expo one year warranty. 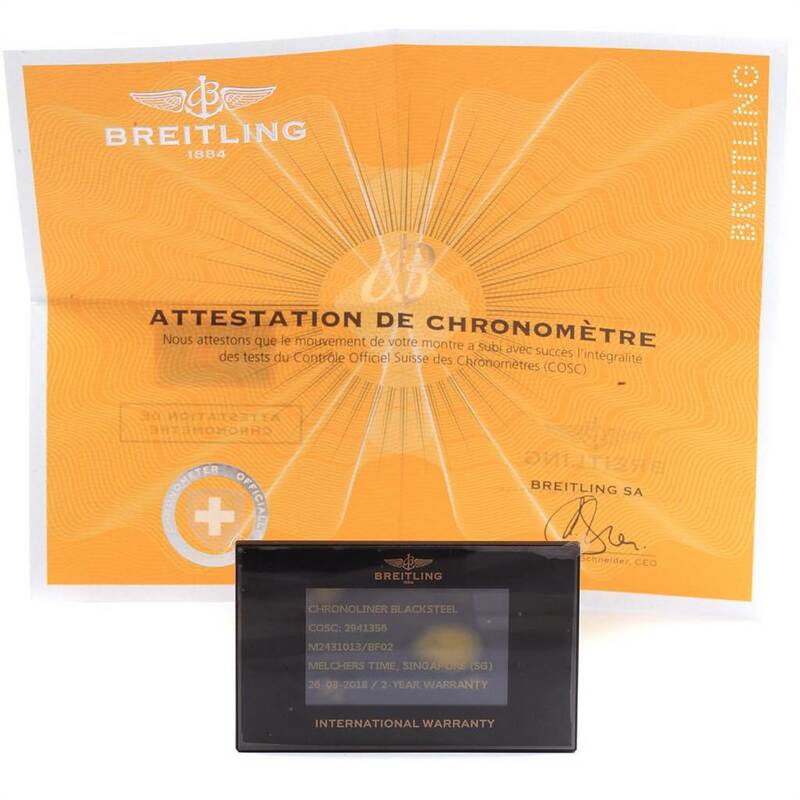 Breitling Chronoliner Blacksteel GMT Chrono Mens Watch M73390 Box Papers. Automatic self-winding movement. 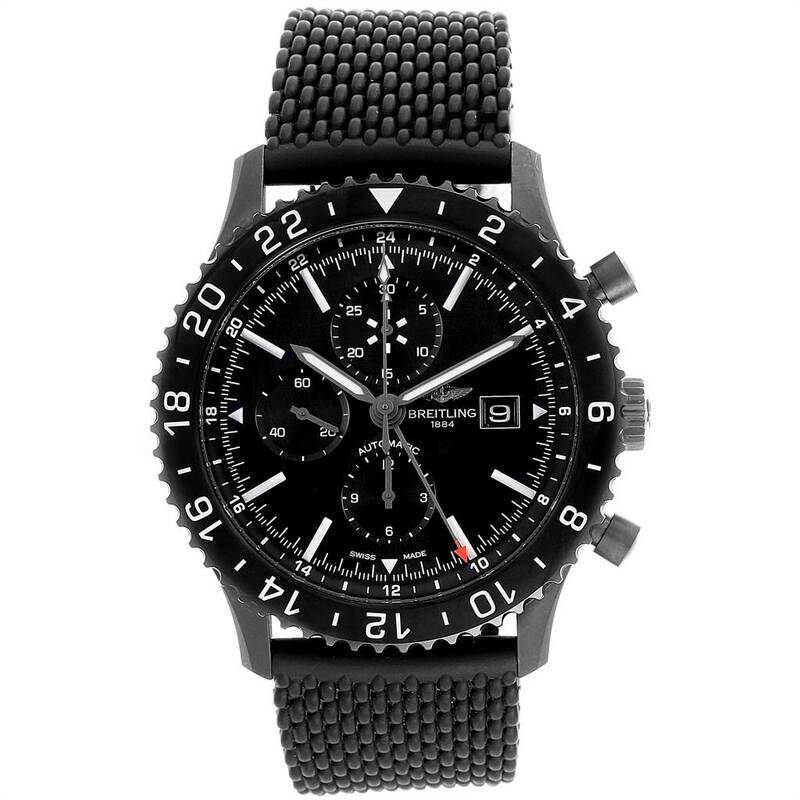 GMT and chronograph function. 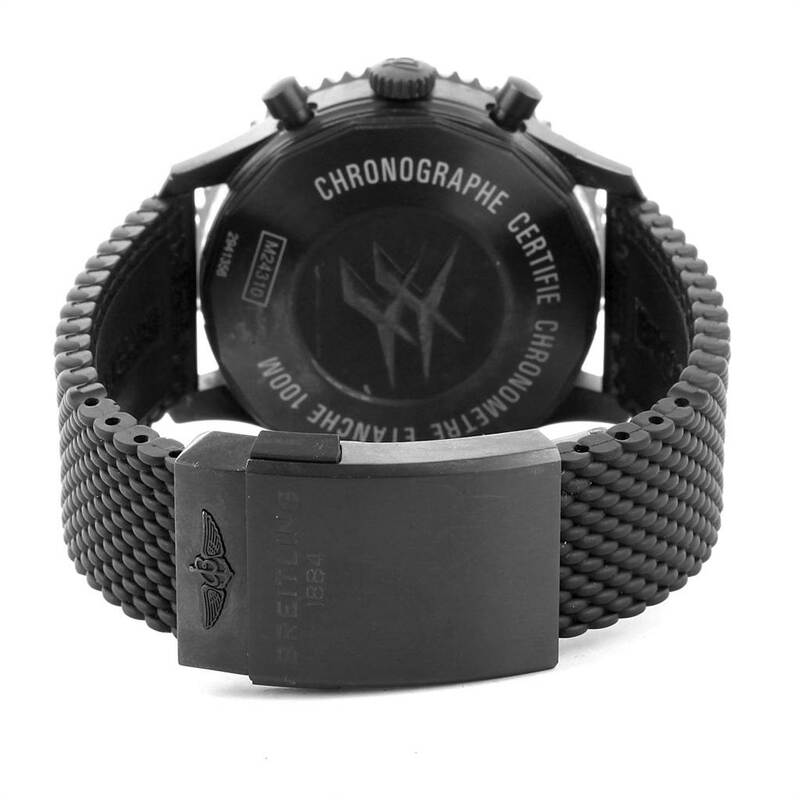 Blacksteel case 46.0 mm in diameter. Polished black bidirectional rotating ceramic bezel with white filled Arabic Numeral and baton hour markers. Scratch resistant sapphire crystal. Glareproofed both sides. 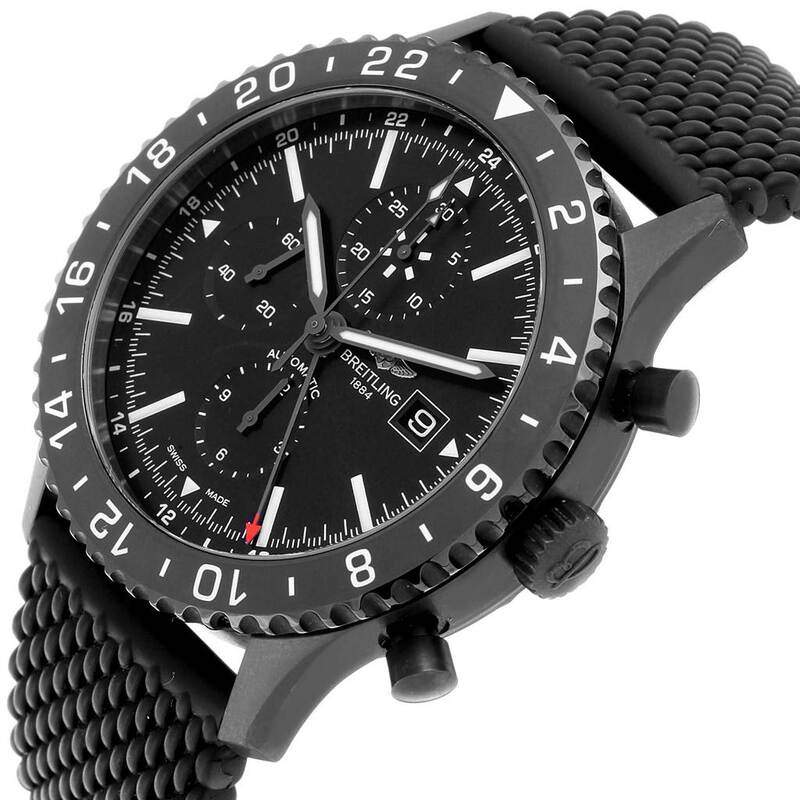 Black dial with baton luminous hands and index hour markers. Large central seconds counter hand. Date aperture at 3 o’clock. 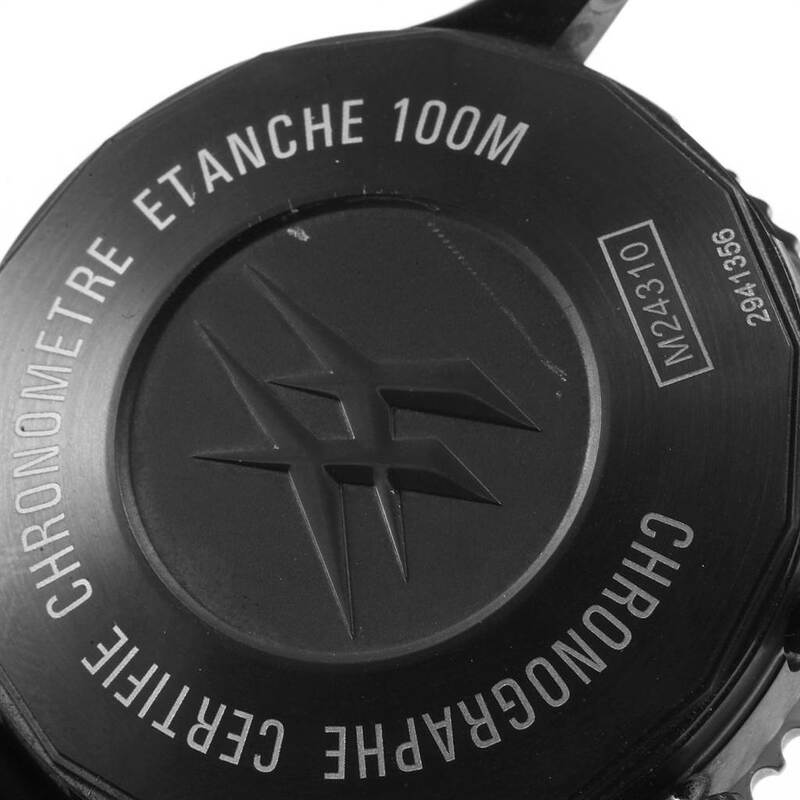 The chronograph subdials - 30 minute counter sub-dial located at the 12 o'clock position. 12 hour counter sub-dial at the 6 o'clock position. Small seconds hand sub-dial located at the 9 o'clock position. 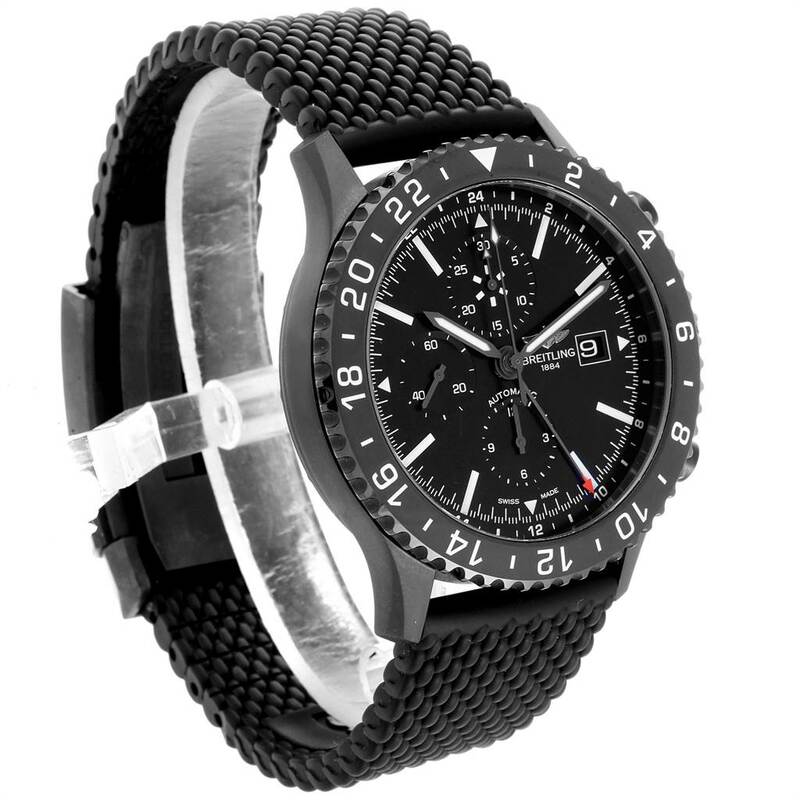 Black rubber strap with push button deployent buckle. Fits 8.5" wrist.